Village at Manor Park implemented the NV900 units in all patient rooms, hallways, and dining rooms on the first floor. The community consists of three wings on the first floor: Park View wing, Sunny View wing, and Terrace View wing. 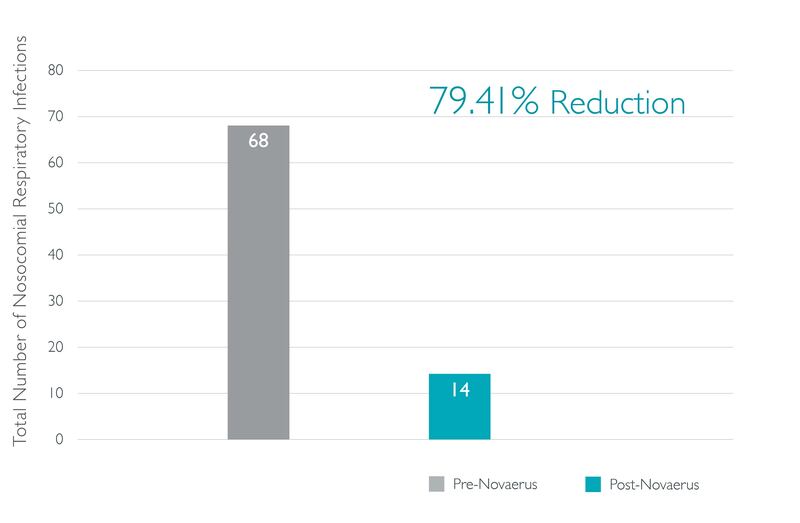 This study compares the total number of nosocomial respiratory infections before and after implementation of the Novaerus technology. A 23-month review was conducted to evaluate the results of implementation. The periods selected for pre- and post-Novaerus review were July 2014 through March 2015 and July 2015 through March 2016. Comparison of like periods reduces the risk of skewed data related to seasonal variances. In the period after implementation of the NV900 units in the patient rooms, hallways, and dining rooms on the first floor, the facility total number of nosocomial respiratory infections at VMP decreased from 68 to 14, a 79.41% reduction. The total number of nosocomial respiratory infections in the Park View wing decreased from 16 to 5, a 68.75% reduction. The total number of nosocomial respiratory infections in the Sunny View wing decreased from 32 to 5, an 84.38% reduction. The total number of nosocomial respiratory infections in the Terrace View wing decreased from 20 to 4, an 80.00% reduction.